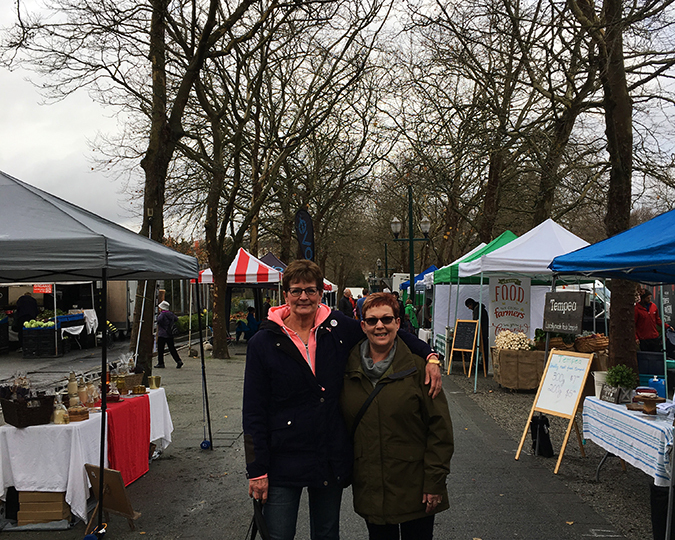 Jeri and Deb are longtime, dedicated fans of our Sunday winter market at Hastings Park. They shop weekly at the market and spread their love amongst a variety of farms and producers – find out their top picks from their market below in our Q & A! Q: How long have you been shopping at Hastings Park? Q: How did you find out about the Hastings Park Market? A: Online I think? I can’t really remember, we’ve been coming for too long! Q: Do you shop at any other farmers markets? A: We live on the border of East Van and Burnaby so we’ve been to the Burnaby market in the summer a couple of times but really, Hastings Park is THE market. It’s our favourite market – we shop here every week! A: Oh! Everything is good! Meat, cheese, soup, eggs, alcohol. Q: What are you favourite winter veggies to get at the farmers market? A: Cauliflower & heirloom carrots. Q: Who are your favourite Hastings Park vendors? A: Oh my gosh, there are so many. We LOVE Greendale for meat and Rockweld for chicken and eggs. Pierogis are good too. Oh and pies, Chef Enrick has amazing pies. Hastings Park Winter Market takes place every Sunday, 10am-2pm until April 29 at the PNE. More info on the Hastings Park page.